iSecurity hole is not so good. This wouldn’t happen with a BlackBerry. Be wary of using your iWhatever on public networks until the patches are made. The scary part is not knowing how long the “bad guys” have been exploiting this. For all the bad rap BlackBerry got for their product, one thing that they never compromised on was security. From device, through the phone carrier, through the BB data center, over the Internet, and to your company’s mail server. Comments Off on iSecurity hole is not so good. This wouldn’t happen with a BlackBerry. 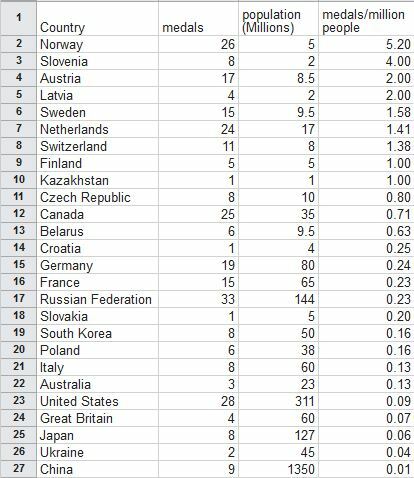 When looking at the medal count from the 2014 winter Olympics, at a glance it appears the United States did really well finishing with the second-highest medal count of any country. 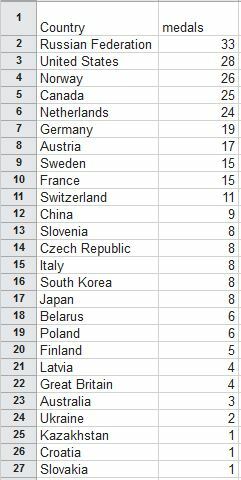 Norway even earned 8 times more medals than Canada! 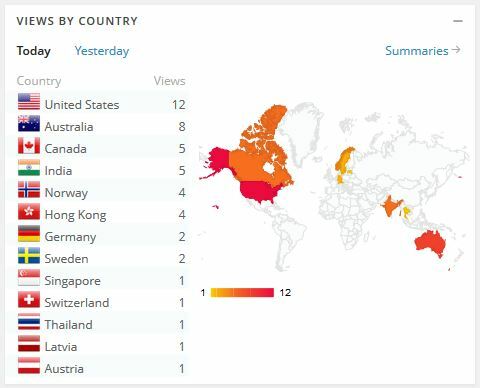 Update: In the first 10 minutes of posting this article, Norway had by far the highest number of visits per capita! A few weeks ago I mentioned on the first day of IBM Connect conference that it is clear now beyond any doubt that computing power is becoming the next utility like electricity, phone, water, and cable TV. I predict that there will come a day in the very near future when few companies will still have their own physical data center. This article at thestreet.com is more proof of that as the gaming industry is the first to make this move. But even more interesting is that IBM, not Amazon, Google or Microsoft, is leading this trend. This adds even more credibility to IBM SmartCloud for Social Business and why I see it eclipsing Microsoft Office 365 and Google Apps in the coming years as businesses of all sizes seek more business-directed solutions than what those consumer-focused, consumer-driven businesses (Amazon, Google, and Microsoft) can provide. Here are several essential tips to avoid users having problems after migrating users’ mail to SmartCloud and to avoid having problems during the migration. 1. First, make an initial pass with the Onboarding Planning Tool (OPT) as early in the migration planning process as possible. You will want to get a jumpstart on fixing all the errors it is going to find that you never knew you had. This will also help to identify all those orphaned accounts no longer in use so you can get a more accurate count of how many licenses you need. 2. Look at the mail files on your server with the admin client. Sort them by size. If you have any over 5 GB, then open each and see how many documents are in the inbox. If you have a lot of these, make an agent to scan them all and create a report. For any that have more than about 1000 messages in the inbox you should have the owner clean it up before they are migrated. This is a performance issue. In case you’re wondering, I’ve already asked IBM to add processing counting the inbox documents and the number of folders to the OPT. It is more likely to happen sooner if others request it too. 4. If you aren’t already using local mail replicas and managing them with MMR, then you are best off getting this setup on all users before you start migrating. You can do it after the migration as well, but creating the replicas will take longer because it is pulling it down from the Internet instead of from servers in your data center. Do NOT try to do it at the same time you migrate users. You will inevitably have problems and it will give the impression the migration was the cause. For users with excessively large mail files or with a high document count in their inbox, create the local replica first and have them do their clean up work locally. If you use the MMR settings on the Mail tab of the Desktop Policy settings, you can also tell it to create the full text index automatically too. Your users will be thankful. Be sure to teach them how to use it too! These tips aren’t documented in the IBM SmartCloud Wiki. I prefer not to use this method since this is only being used temporarily. If you cannot reproduce the error while running in basic mode, the problem is probably due to an Eclipse configuration issue. In such cases, the brute-force method of solving the problem would be to delete the \Workspace folder and cache.ndk and maybe even the bookmarks.nsf. This may work, but it also deletes many settings that have been customized for that client. A less drastic, but not publicly documented method is to launch the Notes client with parameters that will clear the Eclipse cache or reset the configuration. 1. Click the Windows Start button, type cmd and press enter. This will launch a command prompt. 2. 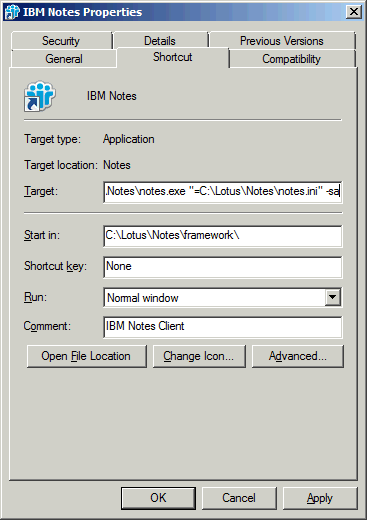 Change the current path to the Notes Program directory. Each of these commands has a specific impact on the Eclipse files. The full impact is not publicly documented, so you may want to make a backup of the \Workspace folder first and if you have access to IBM technical support, it is best to open a ticket with them before using these commands. But this is another tool to add to your Notes client repair kit. IBM has published the list of business partners certified in onboarding to IBM SmartCloud mail. Our company, Divergent Solutions LLC, is one of only 10 companies currently listed for the entire U.S. that IBM has entrusted to perform such migrations. So what exactly does that mean? Well if you are considering a cloud alternative for your company’s email (whether it is currently on Outlook, gmail, or Notes), Divergent Solutions can handle the process from end to end . Licensing, planning, environment preparation, project management, execution. Divergent also licenses SmartCloud for Social Business. Social Business software is most effective when combined with a deployment and adoption strategy. We help with this too. Check out the Divergent Solutions website or contact me for more info. (Long article. Jump to the meat at the end if you don’t want the full story) If you left before the end of the conference, you missed the best part. Thursday always holds the crown jewels: GURUpalooza, Ask the Product Managers, and Ask the Developers. Each of these sessions have a panel on stage and give attendees a chance to ask any question they wish or give their suggestions. If you were there, you already know this is my favorite day of the conference. No surprise given my love for product design and chronic divergent thinking (I don’t think outside the box. It’s more like there is no box.) This can be a curse at times, but on Thursday I revel in it. Then comes Ask the Product Managers. Originally started at Connect 2013 by Ed Brill, probably in response to the many questions that were more befitting of the product managers than the developers, as they were more about product direction than specific bugs or features. This is where all the hard questions are asked that the audience tries to put the panel on the hot seat. Since Ed started his new role in Mobile at the end of the conference last year, this session was hosted by Kramer Reeves, Director, Product Management, Messaging and Collaboration. Third comes Ask the Developers. This session has a long tradition of being the final session before the closing session. It has taken on a more light-hearted atmosphere as most of the toughest questions have already been fielded in the Ask the Product Managers session, hosted by John Woods, Director of Development, Domino and SmartCloud Notes. To paint the picture, these Q&A sessions are all held in the Swan. they open up the 5 large conference rooms to make one large, wide room. There are 4 wide isles between the chairs and at the front of each isle they set a microphone for anyone in the audience to line up in front of and take a turn to ask their question. The rules for these sessions are all the same: Each person gets to ask one and only one question and must then go back to the end of the line at one of the mics again to ask another question. Questions are taken from each mic in a round robin format. I took my usual spot at the mic in the isle directly in front of the stage. I believe these sessions were recorded this year and are available for replay on the web. I am working on getting a complete list of all questions asked in each of the sessions. Meanwhile, here are the questions I asked this year. I am hoping that by publishing it, next year we can reflect back on what happened over the year and see if our input made a difference. 1. Roaming is not officially supported by SmartCloud, even with the data stored on a local server. Do any of the Gurus have personal experience using Roaming with SmartCloud that can speak to any issues using it in a SmartCloud environment? A: No one on the panel has experience with it yet. 2: What is your opinion of the impact adding Kenexa to Lotusphere has had on the conference? A: As expected, the responses spanned the board. Great that it draws people from line of business (HR users and decision-makers) so they can see what solutions are available and not rely on IT staff to spread the word. Bad that the Opening General Session had all the technical details of substance removed to appeal to the non-technical audience. Interesting to see them focus on the solution and not the technology behind it, but unfortunate that they made no references whatsoever to what software was used in the case studies they showcased. Also disappointed that the party at a park was moved to Tuesday night because the kenexa sessions only ran through Tuesday. I expect there will be much controversy on this conference merger for a long time to come. 1. While the “Hollywood Squares” style multi-camera web conferencing is a great stride forward, most of us still operate our web conferences from a meeting room with a group of people. When will Sametime support a roundt able camera like the competitors have? 2. We need SAML to work with Sametime and Traveler. 3. The Notes admin client hasn’t been updated since R6.5. Can the UI be updated and possibly include integrated tools to administer SmartCloud? 4. When will we see migration tools to move from Microsoft Outlook and Office 365 to SmartCloud? 1. In the user preferences on the Basic Notes Client Configuration tab, Additional Options list, Can you add numbers to the list so it is easier to find and to refer to the items? 2. SmartCloud web mail has a button to mark messages as SPAM. Can this function be added to the Notes client experience? 3. SmartCloud does not update the person documents with the users’ client version. Can this functionality be added? 6. Add official support in SmartCloud to use Roaming with the data stored on local servers. 7. Add support for middle initials in SmartCloud. 8. Allow the customer full control over all SmartCloud system-generated emails sent to users. 9. Improve the SmartCloud administration website and consider integrating it into the Notes Admin client. 1. Provide functionality to remove the icons of the old mail files when a user is migrated to SmartCloud. 2. In the SmartCloud OPT tool, add the test to count the number of messages in the inbox and the number of folders in the mail file before migrating to alert to possible performance problems. I’m sure I offered many more ideas, but this it what I remember. What are your thoughts about these? Do you have ideas of your own? Please share them here. Or better yet, Call IBM technical support and open a PMR for it. From that they will create an SPR and if enough people request it, you will almost certainly see it in the product. You should also post them on IdeaJam to get more visibility. Just know that IBM doesn’t monitor that website. They only listen to PMRs and Lotusphere attendees. Don’t think they are listening? Think again. The Purge Interval Replication Control is just one example of a feature I pushed for that made it into the product (after presenting it in the Meet the Developers lab and at Ask the Developers session).